The most important source is his own account, inscribed in several languages and set up around the vast territory that he controlled. 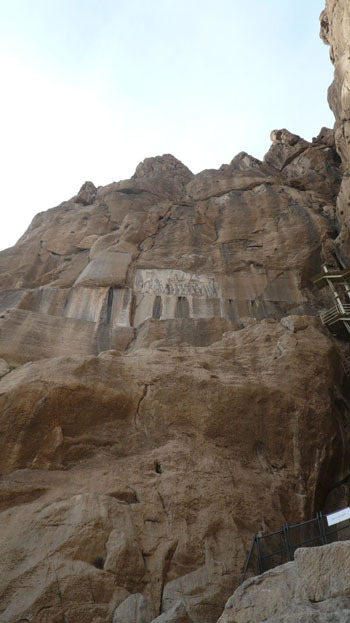 One version, at Bisitun in western Iran, is perfectly preserved, and is a popular tourist attraction (despite being on an almost inaccessible rock face 300 feet above the road). Herodotus mostly follows Darius' version of events. But was Darius, like many winners, able to write history to suit himself? Some recent historians think so. Cyrus had had two sons. He'd made Cambyses king, and entrusted him with continuing his policies – principally to eliminate the threat from Egypt. 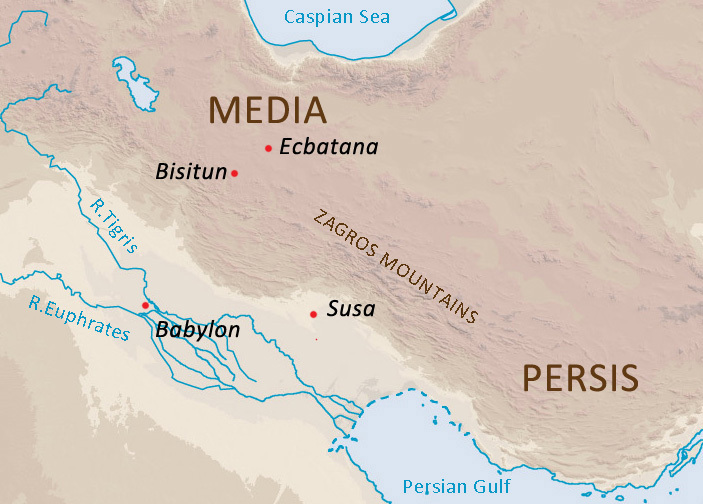 His younger son, Bardiya (called Smerdis by Herodotus) was given a large amount of territory to rule as he pleased. Fearing his popular brother Bardiya might grab powere while he was away in Egypt, Cambyses had him murdered, and appointed a trusted Magus as viceroy (Patizeithes). This Magus had a brother (called Gaumata by Darius) who resembled the murdered Smerdis, and unbelievably, was called Smerdis as well. The impostor was kept out of sight - and anyone who knew his true identity was murdered. When Cambyses, still in Egypt, found out that Smerdis was apparently in charge and hadn't been murdered after all, he got the original assassin to confirm he had killed him - he revealed that the Smerdis now king was an impostor, and brother of the Magus he'd left in charge! Cambyses headed home, but died of gangrene on the way - but not before he'd sent for the nobles of Achaemenid descent, and entrusted them with putting things right. But they believed the fake Smerdis was the real one - and that Cambyses wanted to discredit him. Fake Smerdis continued to reign and won popularity by cancelling military service and taxes for three years. Gradually one of the Achaemenids became suspicious: Otanes wondered why Smerdis was so reluctant to be seen in public. His daughter was married to Smerdis – but she didn't know whether she was sleeping with the real one or not! "My child, you are the daughter of a nobleman. If your father tells you to do something dangerous, you must go through with it. If he is not Smerdis son of Cyrus, he has no business sleeping with you and ruling over the Persians, but must be punished. This is what to do. As soon as you're sure he's fast asleep, feel his ears. If he seems to have ears, you know you are sleeping with Smerdis, son of Cyrus. If he has no ears, it's the impostor. His daughter replied that this was indeed a dangerous mission. If he did turn out to be earless, and he caught her feeling for them, he would kill her. But she agreed to do it. [Cyrus had cut off the false Smerdis' ears as punishment for a serious crime]. When it was next her turn to sleep with her husband (Persian women take it in turns to spend a night with their husbands), she waited until he was asleep, and felt for his ears. It wasn't hard. In fact it was easy to find out that the man had no ears! Next morning, she told her father. 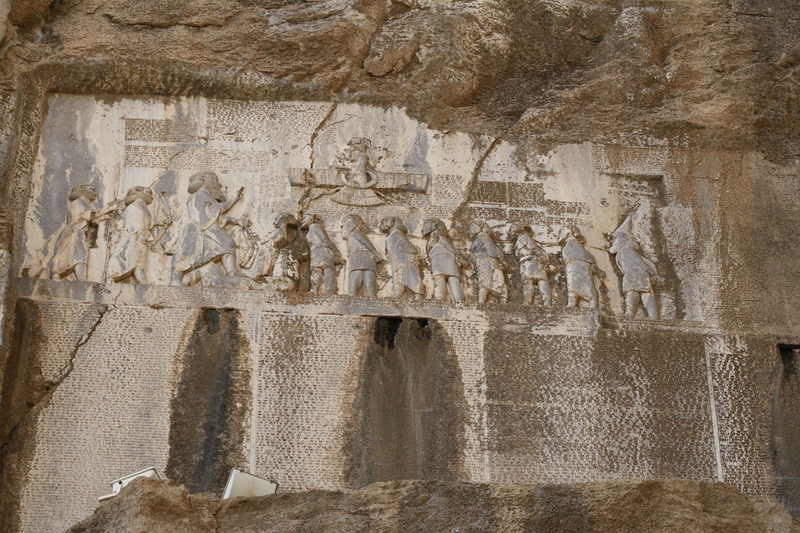 Otanes collected a group of six Persian nobles to unmask the Magi. They were joined by an Achaemenid called Darius, who claimed only he'd known all along about the fake Smerdis. Then thanks to the help of the god Ahura Mazda, Darius and the other six killed the impostor. Darius was made king, and the true rulers (the family of Cyrus) were restored to power. Darius then crushed rebellions in Persia, Elam, Media, Babylon, Assyria, Egypt, Parthia, Margiana, Sattagydia and Scythia. This is Herodotus' dramatic account. Compare it with Darius' own more austere version below. Some historians find Darius' story unconvincing. Achaemenes is not mentioned by Cyrus as an ancentor, but Darius from now on refers to himself, Cyrus and Cambyses as Achaemenids – descendants of Achaemenes. Could he have been a usurper who was himself responsible for the murder of Bardiya (Smerdis)? Certainly he was the one who gained most from it - and who had the opportunity to write his own version of events. I am Darius, the great king, king of kings, king in Persia, king of nations, son of Vishtaspa, grandson of Arshama, an Achaemenid. Darius the king proclaims: for this reason we are called the Achaemenids. From long ago we are noble. From long ago we are royal. Darius the king proclaims: Eight of our family were kings before: I am the ninth; nine kings are we in succession. Darius the king proclaims: By the favour of Ahura Mazda, I am king; Ahura Mazda gave me the kingship. The reference to Ahura Mazda is something new. Cyrus had asked for the favour of the Babylonian god Marduk, and believed he had helped him conquer Babylon. The many references by Darius to the help he had from Ahura Mazda show that he had a new god to guide and protect him. Darius the king proclaims: These are the peoples who obey me; by the favour of Ahura Mazda, I was their king: Persia, Elam, Babylonia, Assyria, Arabia, Egypt, Lydia, Ionia, Media, Armenia … [and 13 others] in all twenty-three peoples. Darius the king proclaims: This is what was done by me after I became king: the son of Cyrus, by name Cambyses, of our family, he was king here; this Cambyses had a brother, by name Bardiya; he had the same mother, the same father as Cambyses; then Cambyses killed that Bardiya; when Cambyses killed Bardiya, the people did not know that Bardiya had been killed; then Cambyses went to Egypt. When Cambyses had gone to Egypt, then the people became disloyal; and the Lie grew among the people, both in Media and in Persia, and among the other peoples. Darius the king proclaims: Then there was a man, a Magus, Gaumata by name; … he lied thus to the people: "I am Bardiya, son of Cyrus, brother of Cambyses…"
Darius goes on to say how much people were afraid of Gaumata thinking he would kill many people who had known the real Bardiya. Only Darius dared to speak out, and with the help of a few men and Ahura Mazda he killed him and took away the kingship from him, restoring it to his own family. Can you see the weakness in Darius' story – and why people don't believe him? If no one knew that Gaumata was an impostor, how come they were all afraid to speak out against him? If no one knew it wasn't the real Bardiya, then perhaps it was the real Bardiya. And who would have most to gain by killing him? There's a lot more that Darius has to say – details of all the people who rebelled against him, and how, with the help of Ahura Mazda, he crushed them. The picture on the rock, though, actually tells us nearly everything we need to know. Herodotus' story is full of fascinating extra details – but his basic narrative seems to derive in the end from Darius' version. Darius seizes power in Persia by force. He explains his actions in an inscription, placed too high on a cliff for any human to read. Ever since it was deciphered in 19th century, his account has attracted controversy. Was he the legitimate heir to Cyrus? He said he was - and claimed they both descended from Achaemenes. Persian rulers ever since have frequently claimed a connection with the Achaemenids - the founders of Persian greatness. The inscription is in three languages - not immediately obvious because they all use a similar cuneiform script. It's called cuneiform (="wedge-shaped") because marks were made in soft clay with an instrument with a triangular tip. Elamite and Babylonian - both languages used by scribes in the region for hundreds of years were easy - but the third language was a puzzle. It turned out to be Persian. This was a surprise - it seems that Darius had the script invented purely for this project. Thomas Herbert in 1677 had said of cuneiform inscriptions discovered at Persepolis: "well worth the scrutiny of those ingenious persons that delight themselves in the dark and difficult art and exercise of deciphering". But cuneiform remained undeciphered for another two centuries. Henry Rawlinson was an English army officer, and military advisor to the Persian royal family. Inspired by the recent decipherment of Egyptian hieroglyphics, he set out to solve the mystery. Between 1835 and 1847 he managed - at great personal risk (balancing precariously on a ladder)- to copy the script and eventually work out its meaning. What Darius means by Magus is not very clear. Perhaps he simply belonged to a Persian or Median tribe called Magi and wasn't a priest of any kind. Later the term was associated with the Zoroastrians. The Magi became the guardians of the traditions and religious rules and ceremonies. They did not approve of writing, so everything was learned by heart and passed down orally until 3rd or 4th century AD (the Avesta). English "magic" comes from the Magi, because it was believed (wrongly) in the west that they were sorcerers. In St Matthew's gospel, the term used for the "wise men" from the east (though he never says there were three.) is Magi. "...when Cyrus, a fortunate man, became king, he achieved peace for all his friends. He conquered the people of Lydia, and subdued all Ionia by force. God was not angry, as he was born wise. Cyrus' son [next] ruled the people. [Next] Mardos became king, a disgrace to his country and its former kings. The noble Artaphrenes with his friends killed him in the palace, and I [Darius] got the thing I wanted." Mardos = Smerdis = Bardiya: no mention that he was an impostor - Aeschylus wrote over 20 years before Herodotus. &dismissed recently (Shahbazi in Oxford Handbook of Iranian History) as a "fantasy of revisionist historians fond of sensationalism"